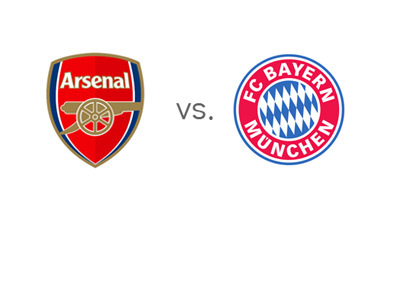 Arsenal and Bayern Munich meet in the UEFA Champions League (UCL) round of 16 on Wednesday, February 19th, 2014 at the Emirates Stadium in London. The return leg will take place in Munich on Tuesday, March 11th. Arsenal are coming into this match in questionable form. They most recently beat Liverpool in the FA Cup 2-1, but they lost to them in the league 5-1 just a week earlier. In-between those two games, Arsenal drew 0-0 with Manchester United. Arsene Wenger's side are second in the English Premier League tables at the moment and they finished their UCL group behind Borussia Dortmund and ahead of Napoli and Marseille. Despite their on-and-off form, this Arsenal side are a lot more dangerous than they were last season, when they faced Bayern Munich (and lost on aggregate) at the same stage of the tournament. Last year's champions, Bayern Munich, also seem to be stronger (if that is at all possible) than they were last season, when they won the treble under Jupp Heynckes. Bayern are undefeated in their last thirty something (nobody is counting any more) Bundesliga matches. They also won their UCL group ahead of Manchester City, Viktoria Plzen and CSKA. It will be interesting to see Bayern play in full force on Wednesday, as they have not faced a blue chip opponent since they lost to Man City at home in the last round of group games. Pep Guardiola's side did not seem to enter that match seriously enough, just like they relaxed and lost to Arsenal in the second leg match at home last season. As far as injuries go, Arsenal are without Theo Walcott and Aaron Ramsey, while Bayern will have to do without their best player, Franck Ribery. Mikel Arteta will also miss the match for Arsenal due to a suspension. According to the odds, Bayern are going to clean Arsenal out in the first leg match, as well as on aggregate. Bayern are actually the favourites to win the whole tournament (valued at 9/4). If Bayern managed to go all the way, it would be the first time, in the history of the current format UCL, that a team defended their title. The neutrals will be hoping that the Gunners can give Bayern a game, for the sake of the game.